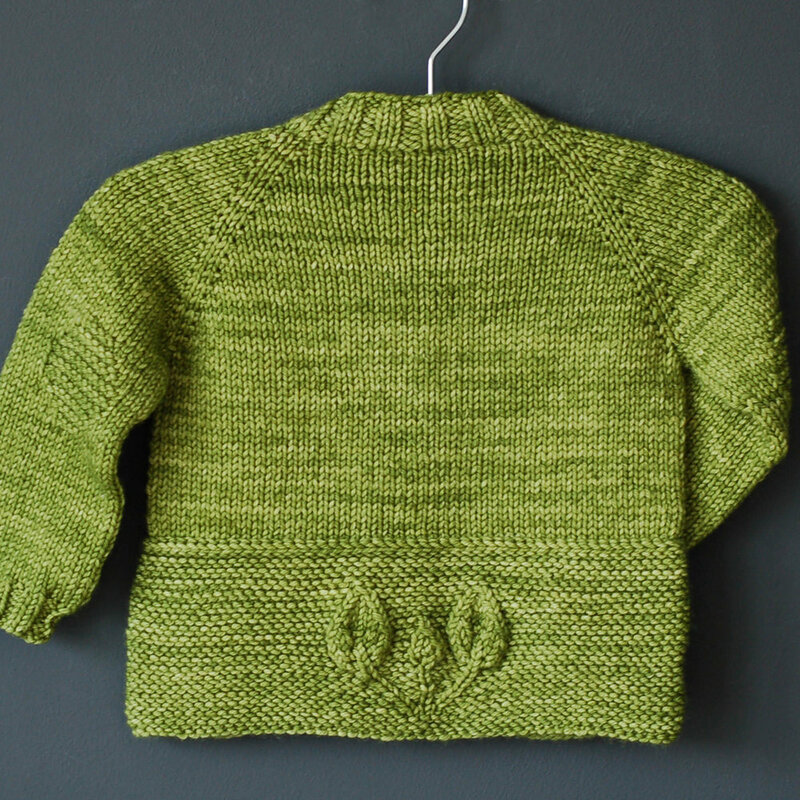 Skills required: long-tail cast on, knitting, purling, increasing, decreasing, picking up stitches, yarn over, knitting in the round, three-needle bind off (explanations provided). Construction: The garter and leaf hem of this cardigan is worked first, then set aside. The top part of the cardigan is knit seamlessly from the top down. It is then attached to the garter and leaf hem using a 3-needle bind off. Stitches are picked up along side edges and neckline to work buttonbands and collar. The sleeves are worked in the round. Optional pockets can be worked. Their lining requires some seaming. The pattern is both fully written and charted, to accommodate personal preference. Note: 10/23/2017 this design has been updated. 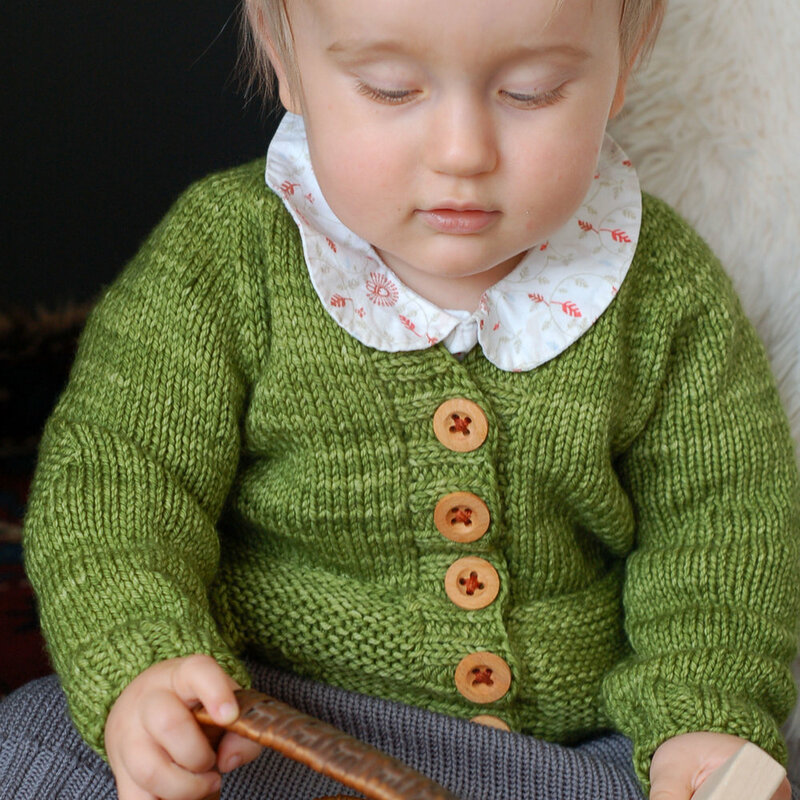 The new version has button band and sleeve cuffs worked in 2x2 ribbing instead of garter. Length has also been added to the body across all sizes. It is also available as part of the Petites Feuilles eBook. Finished garment chest: 18 (18.75, 20.5, 21.25 // 22.75, 24.4, 25.25, 26.75, 28.5) inches or 45 (47, 51, 53 // 57, 61, 63, 67, 71) cm. Yarn requirements: Approximately 275 (300, 350, 400 // 475, 525, 550, 600, 650) yds or 251 (274, 320, 366 // 434, 480, 503, 549, 594) meters of dk to worsted weight yarn. US 8 or 5mm circular needle or size needed to match stockinette gauge. US 8 or 5mm double-pointed needles or size needed to match stockinette gauge (for sleeves). US 6 or 4mm needle or size needed to match garter stitch gauge.